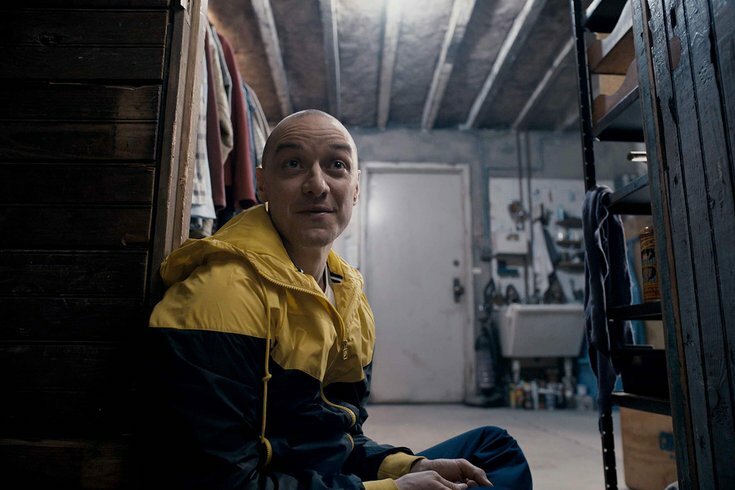 A still from "Split," the second of the "Unbreakable" trilogy. Filmmaker M. Night Shyamalan just unveiled the movie poster for his latest work, "Glass," which, like every single one of his other movies, was filmed in the Philadelphia area. The poster teases what is the third installment of the "Unbreakable" trilogy, which began with the 2000 release of the trilogy's titular film and then, in 2016, with "Split," which turned out to be a surprise sequel existing in the same universe as "Unbreakable." Three characters familiar to Shyamalan fans are revealed on the poster, including Samuel L. Jackson's Elijah Price, Bruce Willis' David Dunn, and James McAvoy's Kein Wendell Crumb. The filmmaker tweeted a photo of the poster late last week. More details on the film will likely emerge later this month at the San Diego Comic Con, when "Glass" is scheduled for a presentation in the venue's biggest space. That won't be happening until July 20. Shyamalan has tweeted throughout the process as "Glass" production winds down and editing kicks into high gear. Amid editing, Shyamalan also found time to speak at Drexel University's commencement ceremony. "Glass" hits theaters Jan. 18, 2019.